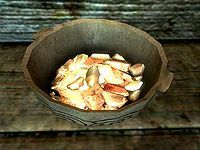 Moon Sugar is the unrefined form of skooma but, unlike skooma, the substance does not seem to be illegal, as it can be purchased from many apothecaries. 1-6 guaranteed samples are sold by the leader of the Khajiit traders. 3 guaranteed samples are sold by a skooma dealer who may be randomly encountered on the roads. Moon sugar is one of 3 items needed to cook an Elsweyr fondue. Moon sugar is also an ingredient used in baking the Lavender DumplingHF. This page was last modified on 20 April 2018, at 01:47.